Research shows that early behavioral intervention can improve the social and cognitive outcomes for toddlers with an autism spectrum disorder. * It sounds like a simple statement, but the positive changes in a child’s life are anything but simple. Housed within the Regis Children’s Center (RCC) and launched in fall 2017, the Autism Center provides individualized, evidence-based instruction founded in the principles of applied behavior analysis (ABA). They use various principles, such as positive reinforcement, to bring about a positive change in behavior. 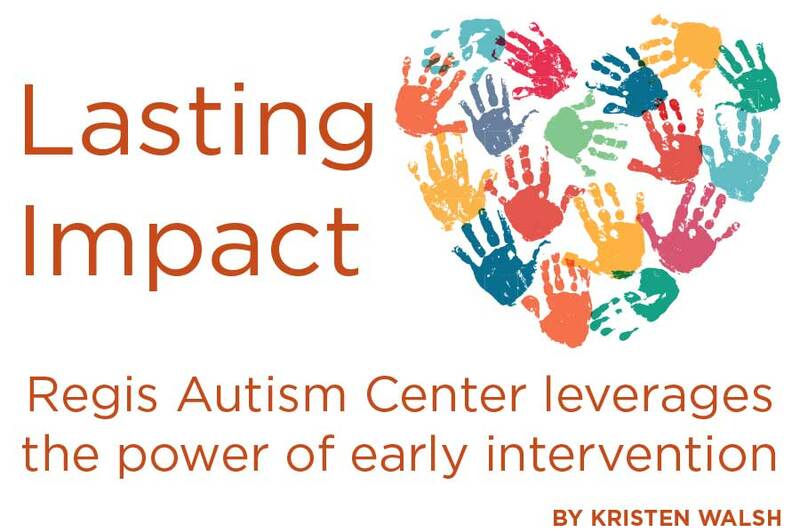 The Autism Center serves students as young as 15 months. Many agency-based programs work with clients exclusively in their home. Autism Center therapists—who are enrolled in the Regis master’s program in applied behavior analysis—support students in the RCC classroom. This naturalistic approach, “teaching in the moment,” includes techniques to manage a number of situations: leaving a parent and transitioning into the classroom, initiating play with peers, adapting to schedule changes, or engaging in conversation, for example. Programming is individualized based on specific needs. Early Intensive Behavioral Intervention (EIBI) has been shown to be effective over other treatments at producing improved clinical outcomes for young children with autism spectrum disorder (ASD; Howard et al., 2005). Diana Parry-Cruwys, PhD, BCBA-D, LABA, assistant professor and practicum coordinator of the Regis applied behavior analysis master’s program, and co-director of the Autism Center, and colleagues published an article examining the effects of EIBI for very young children and toddlers with ASD across several measures, including joint attention, eye contact, imitation, language, and play (MacDonald et al., 2014). Overall, children of all ages made progress using this model, and the greatest progress was seen for children entering treatment around 18-24 months of age. Ninety percent of children in the 18-24 month age group were performing within in the range of their neurotypical peers on cognitive and joint attention skills following one to two years of EIBI treatment. Sometimes things happen organically. They just make sense. And that’s what happened when the Autism Center opened as part of the Regis Children’s Center. The collaboration allows RCC students with autism access to appropriate education and care, while graduate students in Regis’ ABA program develop skills through hands-on experience. The same holds true for Regis graduate students who are fulfilling their practicum requirement. “There is a huge advantage for students to complete their practicum through the Regis Autism Center versus an outside agency because we can ensure quality and also observe how our curriculum and philosophy is being successfully implemented in the classroom setting,” MacDonald says. The philosophy that Putnam and MacDonald speak of is holistic: viewing the child as a whole in regard to family life and school, and capitalizing on individual strengths across different domains. Taylor Johns ’18, who recently graduated from the Regis ABA program, agrees that aligning objectives with RCC teachers plays an important role in the outcome of her work. When a student with autism learns to make eye contact, share a toy, or join in a science experiment with a peer, it may sound simple to some. But Putnam, MacDonald, and Johns don’t think so. Regis students in the applied behavior analysis master’s program earned a 100% passing rate for first-time testers of the Behavior Analyst Certification Board® (BACB®) exam in 2017. And the parent of a student in the Autism Center agrees. “My long-term goal is for my daughter to live as independently as she can and to reach her own potential. Every expert we have spoken to states that children with autism have the best outcomes when their autism is treated early in life with intensive, high-quality ABA programming, and ideally with integration if a child can learn in that environment. * According to research by Diana Parry-Cruwys, PhD, BCBA-D, LABA, assistant professor and practicum coordinator of the Regis applied behavior analysis master’s program, and co-director of the Autism Center (MacDonald et al., 2014).